Katey Price is a visiting assistant professor in the Communication Studies department. Originally from Grand Rapids, she has her Ph.D. in health communications, and as a continued part of our new professor profiles, we met to find out who she is, what she does and how she’s settling into her position at Albion. Jamal Yearwood: First off, could you talk about your academic journey to becoming a Ph.D. because I know it’s not an easy process to choose. 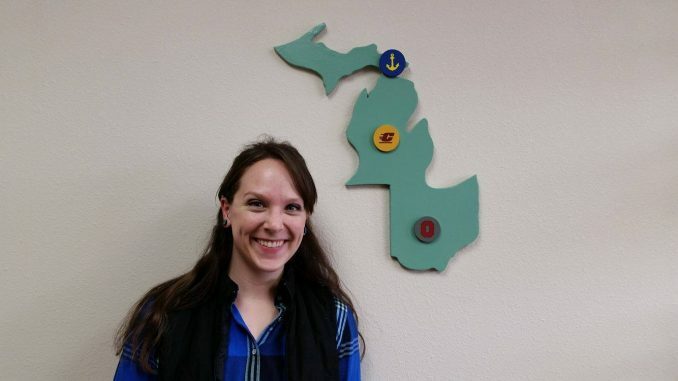 Katey Price: Yeah, so I went to Lake Superior State University in the Upper Peninsula…and I got my bachelor’s in communication and minor in public relations. I had initially thought that after my bachelor’s was over, I was going to go into radio and TV. I wanted to be a personality, like a TV host or radio host. And I did an internship with an actual radio station in Sault Ste. Marie and decided that it probably wasn’t for me … I didn’t see myself fitting into that culture very well. JY: So what did you do from there? KP: I had already been coaching 7th grade volleyball … And I really liked coaching, so I thought that maybe I’d like teaching. So I applied for master’s programs, and I did my masters at Central Michigan University, where I first started teaching. I got my Ph.D. at Ohio State University. Sorry, The Ohio State University and I fell in love with research. When I started learning more and more about research, I realized that when you do research that is novel and new, you literally are creating new information that the world did not have before, and that is literally the most badass thing ever. JY: So coming from Ohio State, is this your first position? KP: No, actually I left Ohio State, and I went immediately right back up to L.S.S.U. I took a position there early; I started before I finished my dissertation, so I was working in a full time tenure track position and writing my dissertation. It was really cool getting to work at my alma mater. JY: Could you compare Albion’s student life with L.S.S.U? KP: I’ve really been enjoying my time here. The students are a lot different here, not better or worse, just a different culture here. There’s a lot more diversity here, which makes my heart so happy … One of the great things about Albion recently increasing its diversity is [it is] preparing the students who actually go out and have to interact with the world. And when you have contact with people dissimilar from yourself, it makes you better able to do that. So yeah I dig it. I love Albion so far. JY: Okay, tell us quickly everything important about yourself before we finish up the interview. KP: (Laughs) I love the U.P. I love being up there; love the woods, love hiking … I actually just got engaged! So I moved here on the 1st; I got my smartphone on the 4th, and I got engaged the 9th. And we got engaged at the Whitehouse Nature Center, right above the river. JY: Oh that’s awesome. Talk about that as a last point. KP: So yeah we went over to Costco, and then we went to dinner at La Casa. It had started to cool down so (my fiance) was like, “Hey, wanna go walk over there?” And I said, “Sure.” So we walked over there on the boardwalk by the river, and he goes, “Hold up a just a minute.” Then he grabbed my hands, and he said something to me, then got down on one knee and pulled the ring out of his pocket … So he proposes, and I grab for it. And he says, “Hey you haven’t said anything yet,” so I say yes. Then we get back, and he was like, “Do you remember what I said to you right before I proposed?” And I said, “Nope. Not a clue.” So neither one of us has any idea (laughs). KP: Appropriately rated. Am I allowed to say that? I would say they are utilized very well, and they are wonderful with what they do. KP: I personally do not have much experience with Kanye other than what I hear in the social news, and so from that point of view … overrated. From what I understand though, his music is pretty awesome, so I would say on that front appropriately rated because he tells everyone how great he is. Music good. Person overrated. JY: Let’s go with Twitter. Over or under? KP: I think it’s underrated. I utilize Twitter for news, and I get a lot of the stuff I use in class from Twitter. So I think it’s underrated, more people should use it. JY: How about New Year’s Resolutions? KP: Underrated. I feel like New Year’s is a time where you can really try to put forth an effort and change things. It’s like a definitive starting point. It gives you the chance to start over, and I think that if you can actually stick to it, your life can be a lot better. It’s just that people don’t have the motivation and conviction to stick with it. KP: Pssh underrated …The 90’s is when I grew up. The 90’s were awesome. I mean the fashion is hit and miss, but you know, give me flannel and jeans any day. And I’m a happy camper. I don’t have a pair of Doc Martens, but I’m sure that’d I love them. Music … 90’s music … especially right? I feel like 90’s music was a huge turning point. KP: Overrated. I’m just so tired of advertising. KP: Overrated! I use it all the time, but there is something nice about using an oven and a stove to reheat things … The condensation and even just thinking about [how] they say microwaves are safe, but you never know. I mean that’s radiation, so you never know. And on top of that, the stove and oven force you to be patient. And as a society we don’t have a lot of patience. JY: Okay last one, Super Bowl commercials. Over or under? KP: Appropriate … I think America knows what they like, and they like Super Bowl commercials.